And then there was a boy who would be king. What is art called when it portrays a real person? It is called a portrait. This is a portrait of a real person named Louis XV. Louis XV became king of France three hundred years ago. France is a country in Europe that was and still is a leading world power. This portrait was painted at the time of Louis XV’s coronation, when he became king. Exactly how did Louis become king? Was he elected? No, he inherited his position from his great-grandfather, Louis XIV. Louis XIV had been the most powerful king in all of Europe for many, many years. When Louis XIV died, Louis XV became king. How old do you think Louis was when he became king? He was five years old. 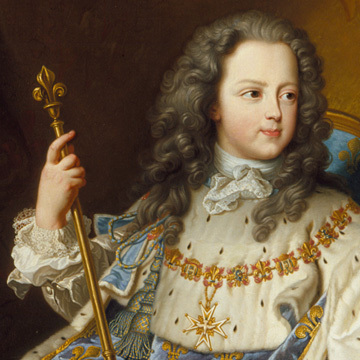 In this portrait, the artist made Louis XV look older than five years old. Why do you think the artist did this? Do you think the French people questioned whether a king who was only five years old would be able to rule? Perhaps art played a key role in helping Louis XV wield power. Every nation has a system of government that determines how authority is delegated. What form of government do we have in the United States? We have a type of democracy called a constitutional republic in which the head of the government leads the executive branch separate from the legislative branch. Kings typically inherit their positions. On the contrary, in a constitutional republic as in the United States the person who heads the executive branch of government is elected to power. Who heads the executive branch of government in the United States? The President heads the executive branch. Once every four years there is an election where all citizens who are eighteen years or older may vote for the office of president, regardless of race, gender or property ownership. Have you ever voted in an election? For those of you who are younger, when you turn eighteen, will you vote for president? Oftentimes, art is used as a means to justify power. Can you tell by looking at this portrait that Louis XV was a powerful person? Is he dressed in rich clothing and with many adornments befitting a king? Point out the many details (costume and adornments and action) in this portrait that tell you this mere child is a person of authority and great power. 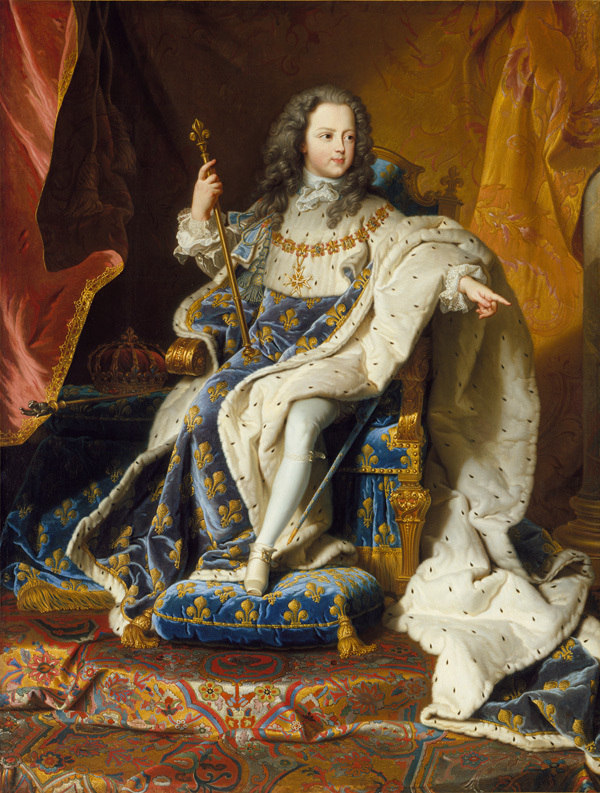 The expensive ermine fur robe that he’s wearing, his pose and gesture of giving an order, his throne, his foot on the pillow and his regalia, including the scepter of rule in this right hand, the insignia of the Order of the Holy Spirit on his chest, the French royal crown and the “Hand of Justice” on the throne, and the sword of Charlemagne by his side make Louis XV look like he is a person of great wealth and power. What if I were to tell you this portrait is similar to a portrait done of Louis XV’s great grandfather? Why would the official portraitist paint Louis XV to look like his great grandfather in his coronation picture? Perhaps the court wanted to reassure the French people that Louis XV was just as powerful as his great grandfather. Perhaps they wanted the people to believe that Louis XV, though only five years old, was fit to rule. Take a close look at this painting. There are a lot of details. Would you say the details look real, almost like the details in a photograph? When there are many details and the details look real, we call art realistic. This painting has a lot of details and the details look almost as real as they would in a photograph, so we can call this portrait of Louis realistic. It may be just me, but the fur on Louis XV’s robe looks so real, if I were allowed to touch the canvas, I am convinced it would be silky soft! Would you like to see Louis the XV in person? All you have to do is visit the North Carolina Museum of Art in Raleigh, North Carolina. Louis the XV is in the Portrait gallery at the museum. Or perhaps you would like a tour. Tours of the collection are given daily, except for Monday when the museum is closed to the public. If you prefer, you can contact the museum ahead of time and arrange for you and your friends to have a private tour. I’m sure a docent at the museum would be happy to show you and your friends Louis the XV and many other works of art. Whether you visit the museum on your own or have a tour with a docent, it will be well worth your time!